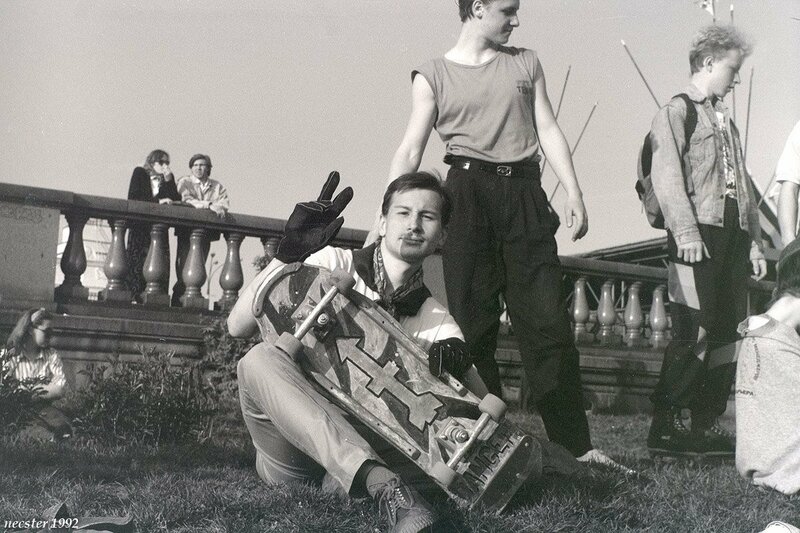 Skateboards first started to appear in the USSR in the late 70s. Many were homemade. DIY magazines aimed at teenagers, like The Young Engineer (Yuniy Tekhnik), published schemes for making your own skateboards at home as early as 1978. 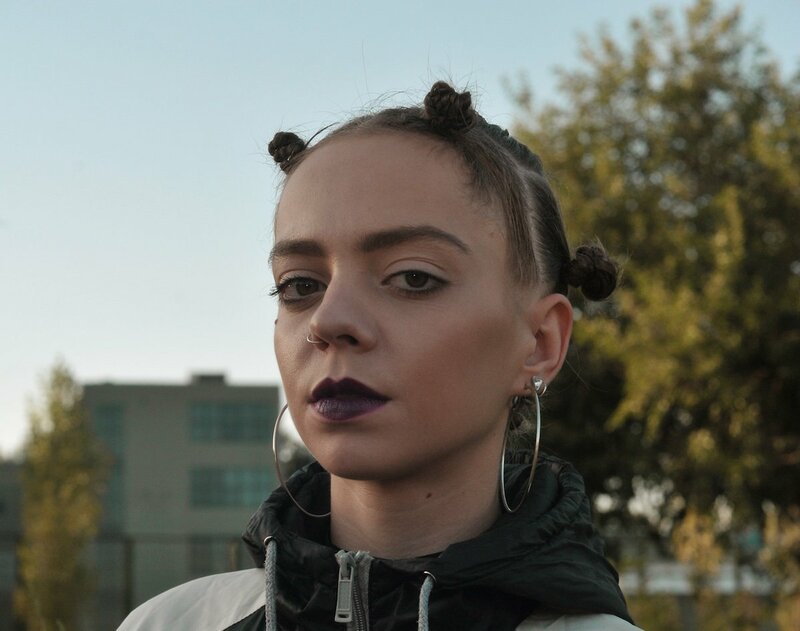 Other media also made reports about the exotic new sport trend sweeping through the distant Western countries – often calling the boards “roller scooters” and “pavement surfers”. 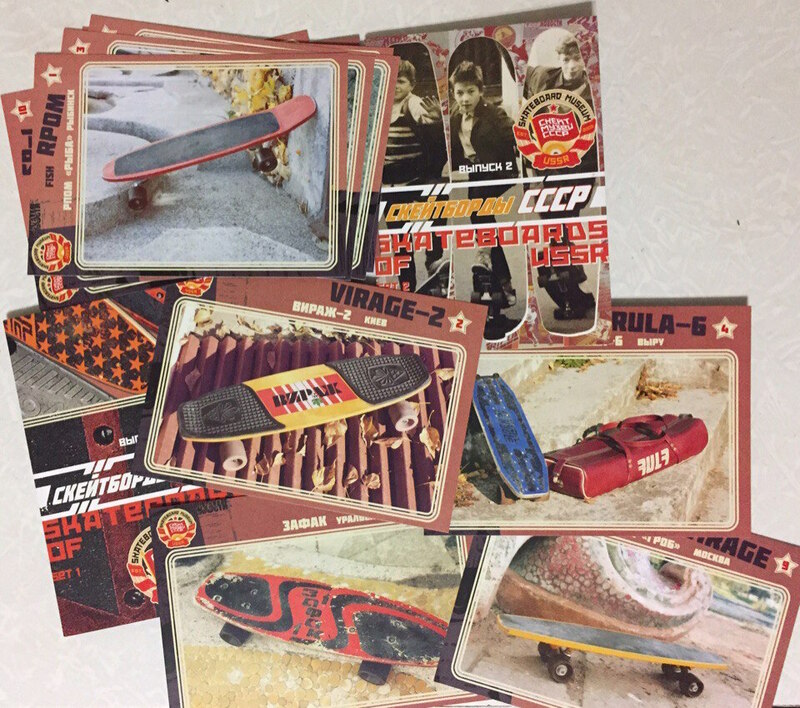 Soon skateboards were put on production lines in the USSR, and ironically, many of the factories producing them served the military — because back then the industry was obliged to produce goods for civilians as well as weapons and ammunition. There were several well-recognised brands like the Estonian Rula, Latvian Ripa, Russian Start and Ukrainian Virazh – but they were relatively rare and expensive. Several years later, Western-produced skateboards became a popular gift for those who got to go abroad. 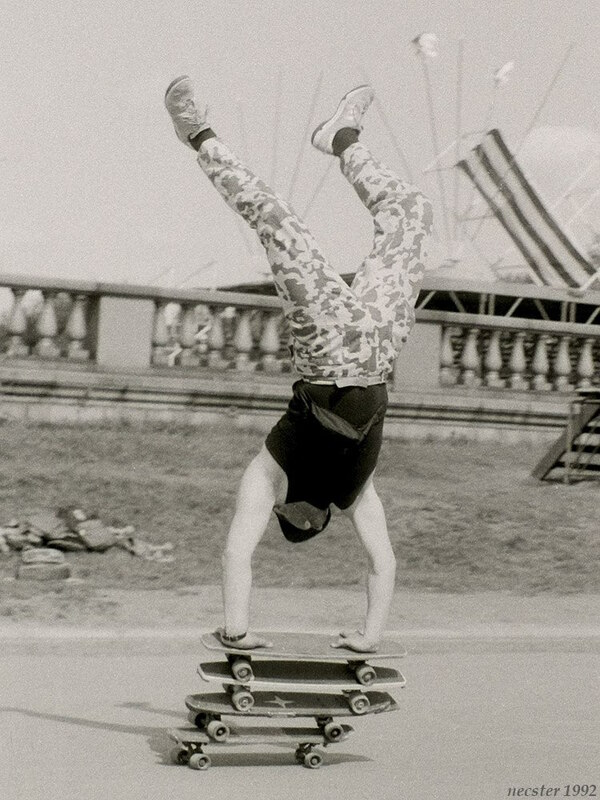 Apart from the occasional local newspaper story, interest in skateboarding was also inspired by the pop culture that emerged after the perestroika. In Courier, a 1986 Soviet coming-of-age film, the main character skates around Moscow with his friend while skipping work. 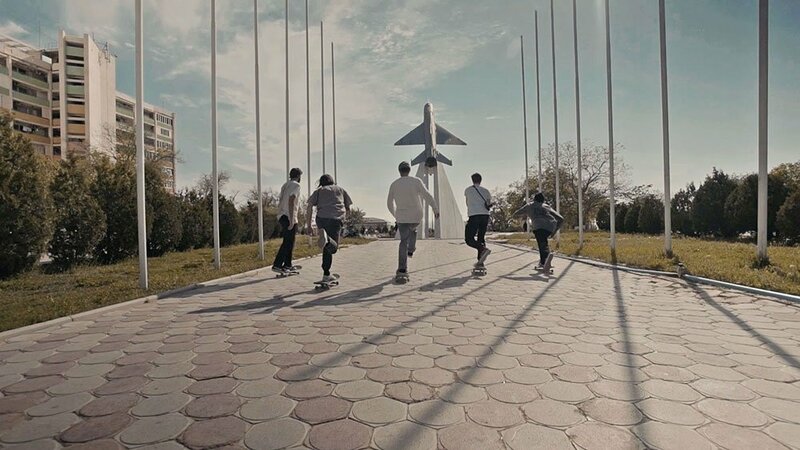 The producers of Primorskiy Avenue (Primorskiy Bulvar), a 1988 TV film, actually held auditions for the USSR's skateboard enthusiasts, and cast the best ones for the scenes of young people showing off their skills on the streets of Odessa. Foreign films also cast their influence – Gleaming the Cube, a cult 1989 US film starring Christian Slater was released in USSR simultaneously with the rest of the world, and many of the early Soviet skaters cite it as one of the biggest influences on the blooming scene that they were a part of, together with the 1986 Josh Brolin-led Thrashin'. 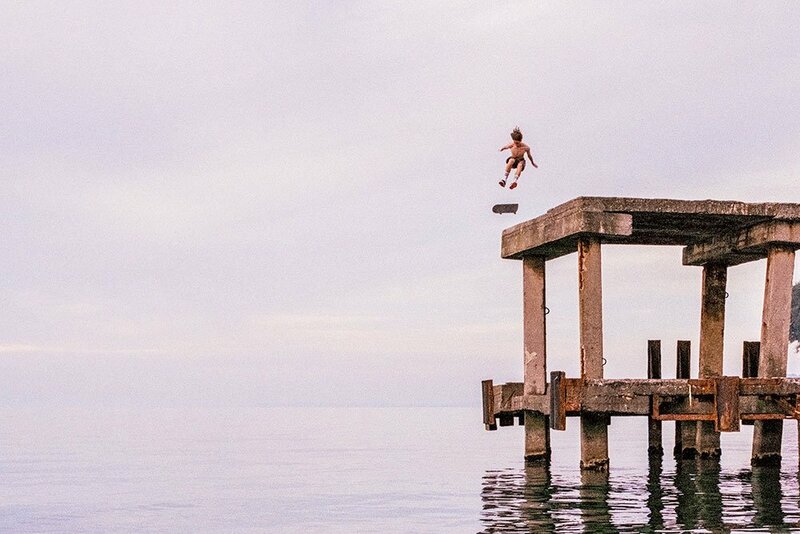 Unexpectedly given its roots in street culture, skateboarding was also present in Soviet circuses, one of the most traditional forms of entertainment. This shaky viral video of Anatoly Kalinin's acrobatic skateboard routine is a famous example of what the viewers were up for between the clowns and the tricycle-riding bears. 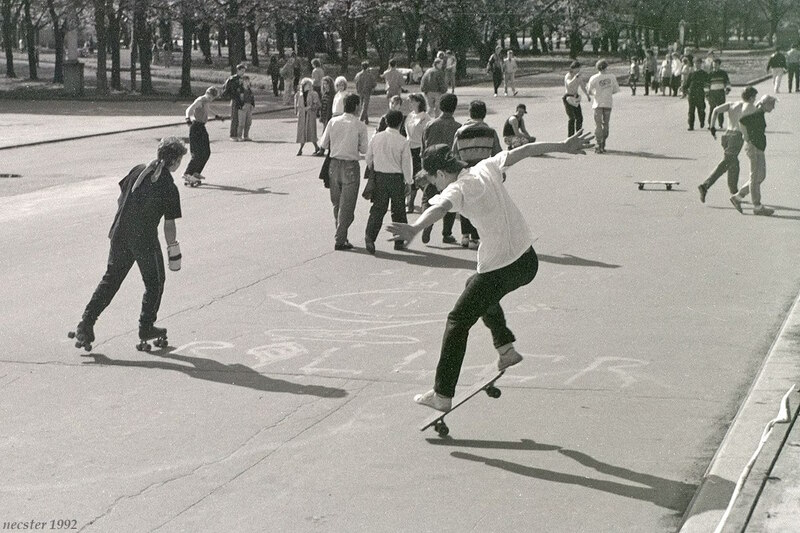 But it wasn't tricks all around – outside of the circus marquees, many Soviet skate pioneers didn't have a clue how to ride when they got their first boards. Slalom – skating downhill and around plastic cones placed on the racetrack – was the most popular style of riding back then – they didn't even know they could use benches, rails, steps and other street objects to do tricks. “I saw an article in the 1979 issue of Modelist-Engineer magazine on how to make your own skateboard, and then I saw some guys skateboarding in the city, so I saved up money until I could buy my own. Then I had to learn everything from practice – how to stand on the board, how to make it move and so on,” says the legendary skater from Minsk Edik Sedoy (Edik the Grayhaired) in an interview with Minsk8.com. 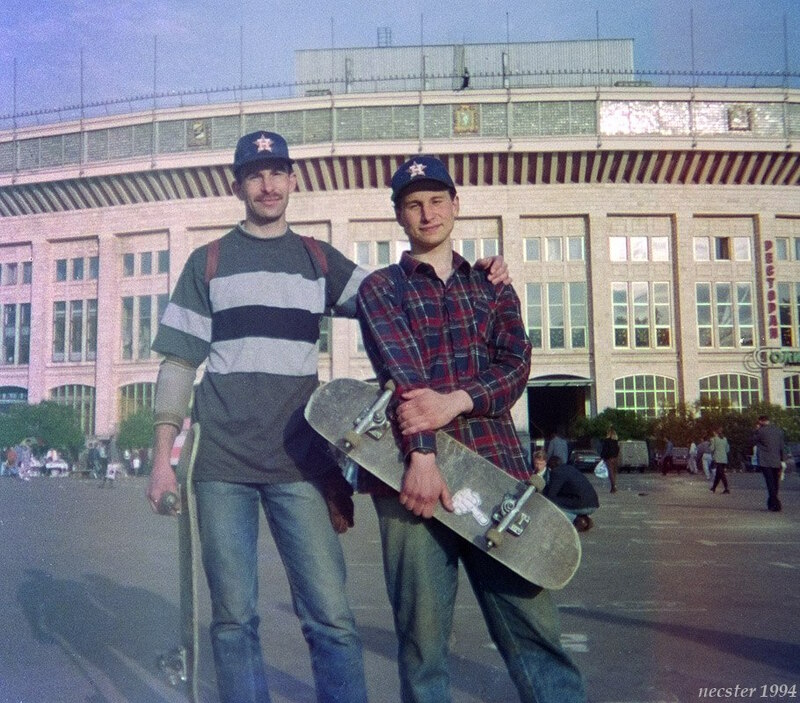 In the early 80s, young skaters started to appear in bigger cities all over the country, from Kamchatka to Riga and from Crimea to Leningrad. Skating groups would hang out in the central squares and other public places with a decent pavement. Moscow skating pioneers say that often in the winter they would break into the basements of the Olimpiyskiy stadium and ride around the vast spaces there. But Baltic countries were the first to fully embrace the sport. By the mid-80s there had already been several competitions in Estonia and Latvia. In September 1991, in the last months of the Soviet Union, an all-Union championship was held in Saratov, a town on the Volga river in Russia which became the unofficial capital of the sport in the USSR. The turnout was impressive for a relatively new sport, with 130 skaters, and the event was widely covered in the press. 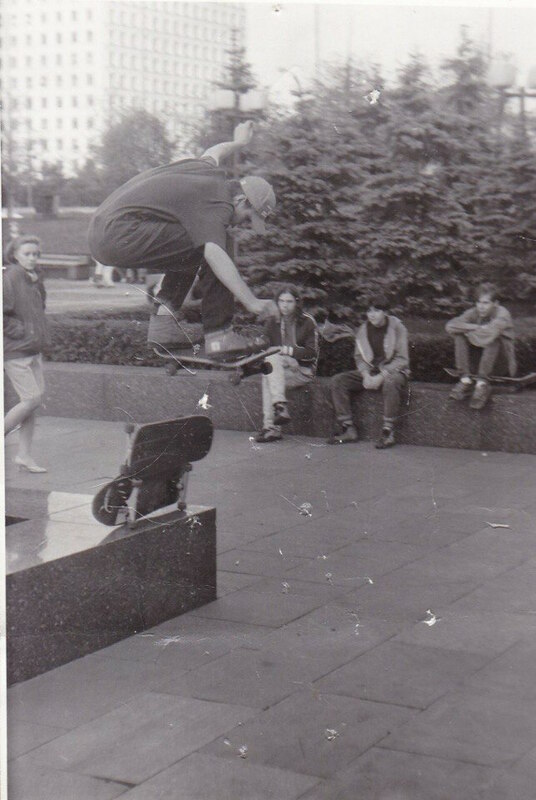 Some argue that the history of the Soviet “pavement surfing” is irrelevant for modern-day skaters because of the riding style differences – contemporary skaters in Russia have more in common with skating pioneers from California. But the roots, some say, are still crucial. Gleb Bentsiovskiy of the Destroyer skateboard store in Minsk has been putting together a Museum of Soviet Skateboarding for a while now. He occasionally showcases the exhibits in other cities, where they attract crowds. “Time is passing and rare skateboards are becoming more difficult to find. 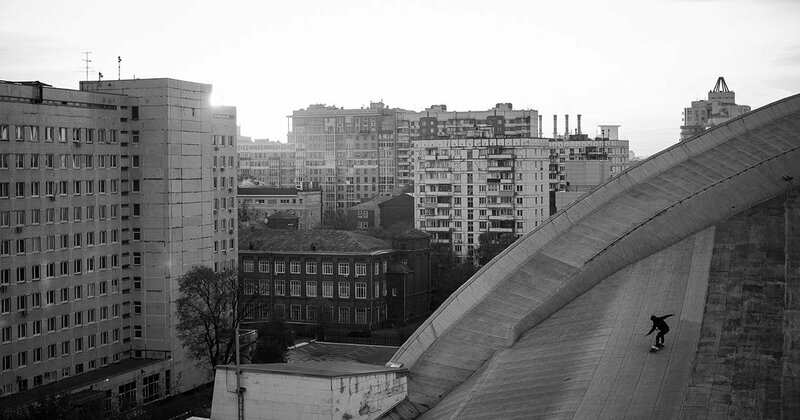 I had the idea of creating this museum a while ago, when the skateboarding scene transformed after the fall of the USSR. I want the exhibition to be open to everyone. I think it's fascinating not only to those who rode skateboards in the USSR but also the younger generation,” Betsiovskiy says.